Statholderens Krostue is located in Stattholdergården, built in 1640 by Peter Grüner and later rented by Stattholder Ulrik Fredrik Gyldenløve. 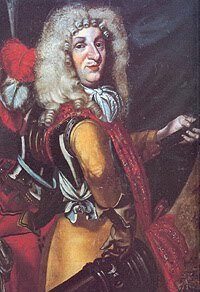 He was the illegitimate son of king Fredrik III of Denmark-Norway and became Stattholder, de facto Viceroy and the Danish king’s representative to Norway in 1664. Statholdergården is located in a busy street, not far from Oslo Stock Exchange and the charming Kvadraturen area connected to the Old Akershus fortress. To enter the basement you have to descend by a steep staircase and you find yourself brought back 370 years. Strong vaults holds up massive stone walls underlining the history of the building. The rooms have been renovated in a neutral manner. Light walls with massive tables and traditional chairs in light wood. No nonsense interior pleasing to the eyes. The service at Statholderens Krostue was exquisite from start to end of the meal. We were attended to by a kind and knowledgeable staff and all our (primarily mine) questions were given an answer to by the waiter or (if difficult) by someone in charge further up the line. All our 10 dishes in 6 servings were served on time or were held back in agreement with us. And then the food…… We experienced one of those meals you just wish to try again. We chose the summer menu with a wine package. 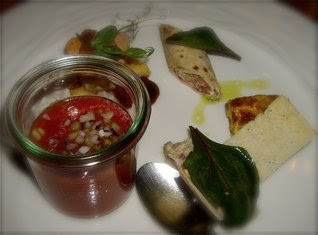 This was a classic menu de degustation, where you were give a chance to experience a wide range of tastes and textures. The summer menu consisted of the following delicacies. Norwegian griddle cake with Norwegian St. Kristina Ham, and "Snøfrisk" cheese. A feast for the eye, as well as the pallet. Gazpacho served as a small shot with delicious garlic and herb croutons. Great balance of flavours, sweet, as well as tangy, as this treat requires sweet, properly sun ripened tomatoes. Those from greenhouses will not do. "Lefse" is the Norwegian counterpart to the tortilla, made partly from flour and potatoes. The mix of Snøfrisk, a soft cheese based on goat's cheese and St. Kristina Ham, a product inspired by its Spanish-Italian counterparts, worked exceptionally well. Wonderfully aromatic and creamy duck liver. Leek quiche with Mackerel rillette was our favourite. Perfectly balanced flavours in abundance, sweetness from the leeks and the warm salty aromas of the fat fish, complemented by the richness of the ingredients. Two items, one baked piece of Fjord Salmon and a roll made from minced crab and salmon meat in a soft rice pasta sheet, served with rich lemon flavoured Hollandaise sauce and steamed asparagus. Fish perfectly prepared, flaky and firm with a pleasant saltness that did not conceal the salmon flavour. Crab and salmon roll had excellent sweet and salty balance. Rich and smooth butter sauce with acidity to cut the rich ingredients on the plate. 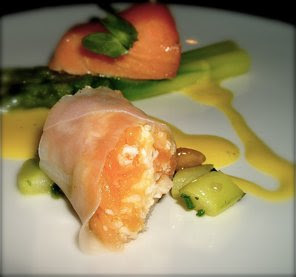 Asparagus prepared to perfection - "al dente". This was one of my favourites, wonderfully clever to combine this firm meaty white fish with a chicken bouillon. Again; fish prepared to perfection, firm and not over cooked as much fish tend to be when served. Bold, strong, but not overpowering range of tastes, from the salt fish to the rich bouillon, sweetness of the beets and celery roots, and interesting parcel of meat ragout on top of fish. Many, but not too many tastes! 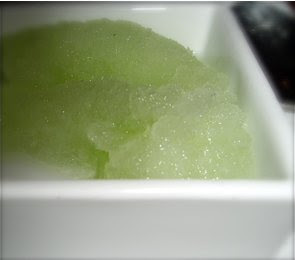 Entre plats are meant to clear your pallet in between multiple courses, and we were served an Italian style sorbet, a "granita" flavoured with lemon verbena. Lemon verbena is a strongly citrus flavoured herb brought back to Europe from South America by the Spaniards in the 17th century. The cool, freshly flavoured granules provided relief to our taste buds before the fifth serving, the "piéce de résistance" of our meal. We were supposed to get meat from "Sidet Trønderfe og Nordlandsfe" or "Urfe", an ancient breed of cattle from the mid part of Norway, but we were served another cut of beef of unknown origin. This did not effect our judgment. This was an excellent dish. The beef was medium done, and mouthwatering, tender as could be. The vegetables and sauce were perfect in consistency and we could enjoy a wide variety of superb sweet, sour and salty tastes blending into a higher union. Norwegian cheese platter with home made crackers, apple compote and marinated sultana raisins. A traditional assembled cheese platter with yellow, brie and blue-cheese varieties from small scale Norwegian producers, served accompanied by sweet side dishes to cut the richness. 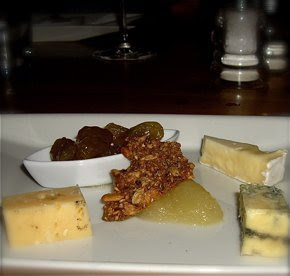 A cheese platter like this reflects different textures, from hard to soft and flavours from the mild yellow cheese to the sharp blue cheese, and the chefs at Krostuen had selected them with care and skill. It was served at room temperature. At this point I had to change dish, as one serving of rhubarb will throw me into strong pain. This as this delicious product contains large amounts of oxalic acid creating kidney stones. I have tried it twice with the same result. I was allowed to choose another dessert, and discovered, to my joy, that they had chocolat mousse as an alternative dish. It is one of these dishes that shows who's a good cook, and definitely those that aren't. The chocolate mousse was rich, creamy and sinful and an ultimate end to a superb meal. I strongly recommend the wine menu. The price may seem a little steep, but you really get much for your money. I have experienced that many exclusive restaurants offer wine menus, and you are served one, or two small glasses of wine at the most. 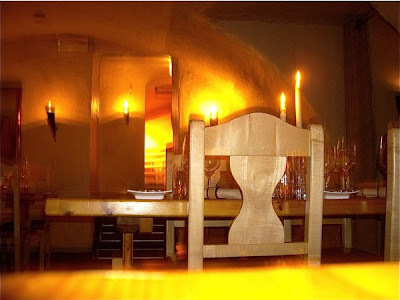 At Statholderens Krostue, you will get wines in far more generous quantities. In spite of the NOK 500 price tag, you leave very satisfied. I was given a complete list of wines served to bring with me, and I left the list behind. This means that I may provide you with little information on wines, grapes, etc. We were served four wines, three white and one red wine. White wines were served to first, second, third, and sixth serving, and the red to fourth and fifth. The wines were especially picked to match the food, and we experienced that they did. They refilled our glasses continually during our meal, and the amount of wine lifted our spirits towards the end of our meal. The meal at Statholderems krostue is the best I've had in years. 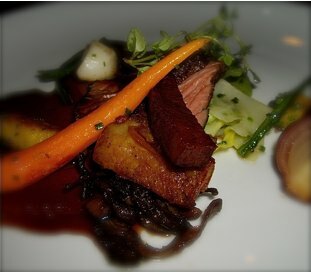 A wide range of presentations, textures and tastes made this meal into a extraordinary culinary experience. Stiansens summer menu highlights the best ingredients from the deep oceans to mountain areas with a focus on local specialties. The menu is prepared according to tradition as well as innovation, combining ingredients in a way many of us never would have thought of. There is much to learn from this, and the the way this food is prepared should serve as an inspiration for us to try something new in our own cooking.